Hui the Yogini: R U Ok? It's RU Ok Day tomorrow. 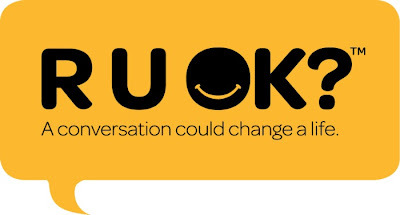 RU Ok Day was created to remind everyone to check in on the friends and family that they care about. Admit it, the best of us take their welfare for granted - when was the last time you asked someone if they were ok? So, to celebrate RU OK Day, I thought I would share my story. Most people in my life know that I've struggled with depression and anxiety, but not many people know how it all began, and what it was like. I will also share some tips on how to notice and support someone with depression, and if you have depression, how you may try to beat it. You can scroll to the bottom of this post to see those if you want to skip the sentimental bits. I moved to Australia at the age of 18. I came and completed my Year 12 in Bendigo, and did very well academically. But socially, it was a pretty tough ride. You see, I had grown up in a small country town in Malaysia, where everyone in my first grade class ended up graduating in my Year 11 class. Ok, that may have been an exaggeration, but it wasn't far from the truth. I had the same group of friends from age 7 and a social life wasn't high priority in my family. We were discouraged from attending sleepovers, and just even from making social phone calls to friends after school. What was the point, our parents asked, when you see them again at school the next day? Back to Year 12... it was tough trying to start over, alone, especially in Year 12 when social cliques had already been established at school. For the most part of the year, I felt really isolated, but in time I made a small group of friends. Then Year 12 ended. 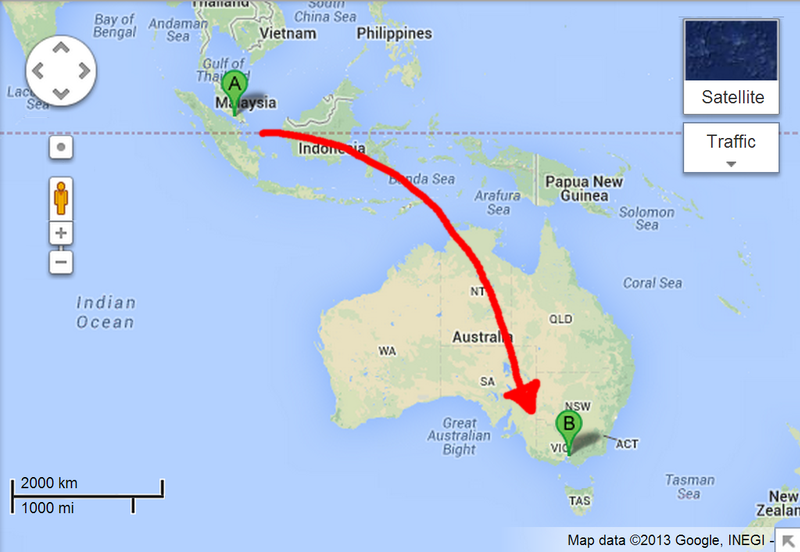 And I had to move again, this time to Melbourne. The thing about Bendigonians is that they kind of stay in Bendigo. So, I had to start all over again. You'd think doing it the first time around would have set me up for the second, but it was harder. I was living in a residential college, so you would think it would have been easier socially. But it wasn't. I was really introverted, and suffered from low self-esteem. To make myself feel better, I got into a relationship and that was when the seeds of depression began to sprout. It began with the contraceptive injection. As you probably know, chemical contraceptive tools may cause depression, and this caused a massive change in me. I became needy, I would cry all the time, and I became so paranoid that everyone was talking about me... about how much of a loser I was. So, I began to withdraw even more into my already closed life. My then boyfriend wasn't too understanding either... all he said when I told him how tough I was finding life... was to "get a hobby". Eventually, he got tired of my clinginess, and we broke up. I think that breakup was what pushed me over the edge. My depression got really bad. I started to have suicidal thoughts, and to escape life, I would sleep. I slept on average, 18 hours every day, waking up only to eat, and to socialize just enough so that no one would know my little secret. I had stopped going to uni. If I woke up in the middle of my 18-hour sleep, I'd reach for my stash of alcohol that I kept by my bedside, to knock myself back to sleep again. During this time, I became a very different person. I craved attention, and did everything I can to get it. I tried as hard as I could to make life "meaningful" again, by seeking new relationships, but my efforts backfired and I plummeted myself deeper into the hole I had dug. This went on for an entire semester. The most amazing thing is... hardly anyone knew or picked up on the fact that I was absent from uni. One lecturer emailed me to find out what was wrong, and helped me pass her subject. I've never forgotten her, or what she did for me that year. I don't even know what made me realize things had to change. At some stage, I realized I was failing uni, so I went to the doctor and got a prescription for antidepressants, and a special consideration form. Amazingly enough, I got through uni that year. The antidepressants did make me functional, but I was still as needy and as paranoid as ever, and my emotions were fragile. One day, tired of having to take the antidepressants and how ill they made me feel, I decided to quit cold turkey, and had a bit of a meltdown. To calm myself, all I remembered was walking down Lygon Street, and stopping by a New Age store called Crystal Heart. I browsed the bookshelf for a while, and was drawn to a few books. Robin Norwood's Women Who Love Too Much, Iyanla Vanzant's Yesterday I Cried, and Louise Hay's You Can Heal Your Life. Those books were a massive turning point for me, especially Louise Hay's bestseller. Maybe the books really helped, or maybe the stars were right, but I came out of my depression shortly after, and was depression-free for about three years. It was during this time that I discovered my love for yoga, and began to soul-search, trying to find answers to the last few years that had seemed so hazy to me. Then, as a result of being in an abusive relationship and from contraceptive pills (I tried a few, including the controversial Yaz), I sunk back into depression again. I was lucky this time around to have a my sister living with me. It was also the first time I decided to see a clinical psychologist, and we worked out a mental health plan to help get me back on track. With the aid of antidepressants and regular yoga, I got my depression under control, and as result, became strong enough to end the abusive relationship I was in. Just for the record, I'm currently depression-free, and haven't been on medication for a few years. I'm always monitoring my emotional wellbeing, and exercise very regularly for fear of a relapse, and also for good physical health of course! Over the last eight years, I lost many friends and relationships to depression, but also forged many more. In a strange way, I credit it to helping me grow as a person, and to be more in tune with myself than ever before. This is a lot harder than it sounds. Someone who's depressed may not just be sad, they may also appear to be more "attention-seeking", or clingy. These changes often just get brushed aside, or go unnoticed. If you are a close friend and notice these things, it doesn't hurt to ask "Are you ok?" If your friend starts to avoid social situations, chances are that something's up. It never hurts to stop by to check in on someone. Always take suicide talks seriously. Often, these talks get brushed aside as "attention-seeking" behaviour. If you think about it, if someone is so "attention-seeking" that he/she needs to talk about suicide to get it, something isn't right. Sometimes, all a person needs is to have an outlet. You don't even need to offer any advice, in fact depending on the seriousness, it's probably better if you don't, unless you have experience in counselling. Also, your advice could sometimes appear to sound as if you are trivializing your friend's troubles, even if you aren't. So, just lend your ears and a shoulder to cry on. If you aren't a person who can closely monitor your friend, then tell someone who can, particularly if they are high-risk. Supporting a friend with depression is tough work. It requires so much patience. Often, you may feel your friendship is taken for granted, particularly if your friend becomes less social or communicative. Or, perhaps you are annoyed that your friend can't just take steps to get over it, such as seek medical help. Just remember that for someone who is depressed, life is overwhelming, and the simplest solutions are distorted to be giant gargantuan steps. You have depression. What can you do? I'm not saying this to be preachy. I'm saying this from personal experience. While it is possible to ride through mild-moderate cases of depression, it never hurts to seek professional help from your GP, or a counsellor. I found the most effective treatment to be a combination of a GP that you trust and like (who would prescribe the relevant meds), and a clinical psychologist. If you are at uni, you will probably have access to uni counsellors who are free of charge. If not, there might be community counsellors around your neighbourhood. Google is your friend. As hard as it is, try to let friends into your circle. It'll may seem like a huge effort, but it is worth it. Know that you are not alone, depression is a very common affliction. Not the best option if you have severe depression, because you probably won't even have the will to read. But if you can read, the self-help section of a book store is amazing. I harp on about Louise Hay all the time, but she really did help me to heal my life. So, check her out. Find out more about depression via online resources such as Beyond Blue. Beyond Blue now also offers a basic online counselling service. You could also try Lifeline, but I haven't had a good experience with them. If you can exercise, do some outdoor walks, or yoga. My personal opinion is that anything outdoors or in a group situation is more effective, so aim to do some group yoga sessions. In any case, any exercise is better than none. Disclaimer: I am not a health professional. The advice above comes from personal experience. Please seek proper medical help for your situation. Hui, what a brave post you've written. Thank you for sharing your story. It's an example to me to be brave in my writing, too.. I like Leonard Cohen's quote about how the light gets in. He says it's through the cracks. So, with every break we grow. I haven't heard that quote from Leonard Cohen but Google tells me it's from his song Anthem. I will have to listen to that! I love Leonard Cohen :) I always think you're very brave in your writing Anne! This is one of the most inspiring blogs I've read. Hui, you're a wonder, so brave and unselfish in the way you're sharing. Heaven only knows how many people you may reach and help with this lovely blog. It has to give hope to many who have so little and a reminder to others, like myself, to say, R U OK and often. Thanks so much. What a gorgeous post, Hui, and thank you for sharing so much of yourself. I'm so happy for you that you've managed to beat depression and come out on the other side, bright and shining!